A visit to Venice, Italy wouldn't quite be complete without a day trip to colorful island of Burano. This small town in the Venetian Lagoon is a 45-minute ferry ride from the city, and well worth the trip. Far less crowded than Venice itself, Burano is known for its lace, its relaxed atmosphere, and the brightly painted houses that line its small canals. Because there are no hotels in Burano and most restaurants close mid-afternoon, wake up early and walk through a quiet Venice to catch the first ferry to Burano on Line 12 from Fondamente Nove. You could also arrange a private water taxi from your hotel for a faster, chicer trip to the island. Don't forget to bring your camera, because this is one of the most photogenic places in Italy. It's like an entire town of Paris' charming Rue Crémieux. Once you arrive, head off to explore the streets and canals, snapping photos along your way. If you're looking to give your shutter a break, shop for local lace and linens, stop in at a cafe for an espresso, and say a warm buongiorno to any locals that you see. It's best to make a lunch reservation in advance for the pretty Riva Rosa Ristorante, and you can even book a private meal on their tiny rooftop terrace for 2-4 people. Trattoria al Gatto Nero is another great option for a leisurely meal, famous for its fresh seafood and beautiful shaded patio. If you're looking for a quick bite without a reservation, try Pizzeria Principe. The main streets of Burano are much busier in the afternoon, which makes it a perfect time to let yourself get lost. Follow all the quiet streets and hidden alleyways you can find - they are just as cheerful as the center of town, but much less crowded. I'd suggest a generous serving of bellini gelato to keep you company as you stroll. When your feet and camera are worn out, head back to the pier to catch the ferry back to Venice. 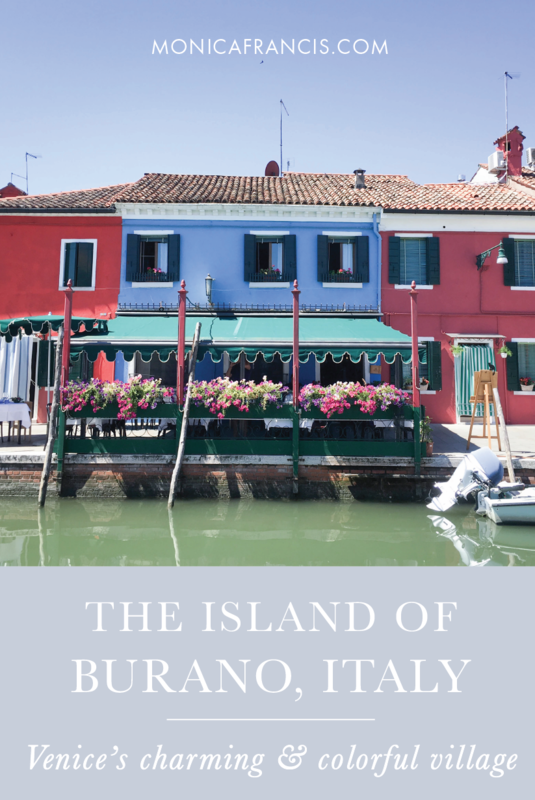 If you have some extra time, stop at the island of Murano, known for its glassmaking. Then return to your hotel for a little riposo before you head out into magical nighttime Venice for dinner.